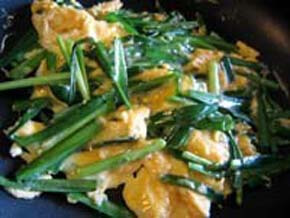 Stir nira(chinese chives),Add seasoning eggs and Stir it easily to draw a circle slowly into from the outside. 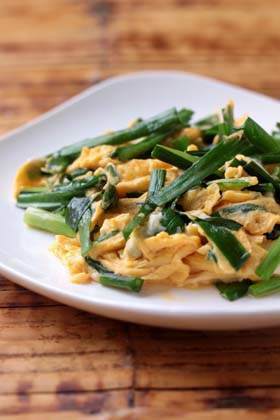 Niratama recipe is exquisite combination of egg and Chinese chives.It is a delicious and super easy. This is dish useful very much when you want something another food.It is delicious even if I put kimchi and bean sprouts. 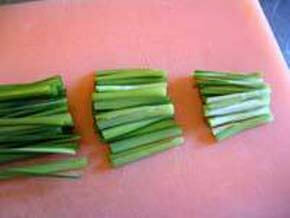 Wash nira(chinese chives),Cut in 3cm width. 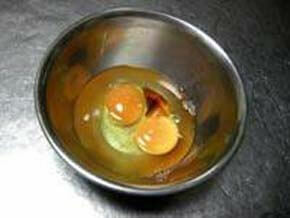 Break eggs and put it in a bowl,Add soy sauce and salt.Combine eggs,soy sauce,and salt in the bowl. Heat sesame oil in a frying pan,Stir nira.Add pepper lightly. 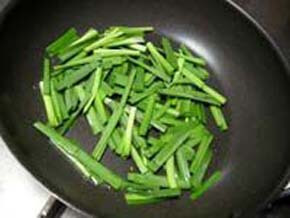 Add eggs,Stir it easily to draw a circle slowly into from the outside. coypright(C) 使えるレシピ®. All rights reserved.